Well the last long weekend till October is over and here come the cold mornings. Its so dark early at night, brrr I hate wintertime. I was in New Plymouth for a couple of days over the long weekend and it was a wet trip to the Naki, but had lots of fun with three grandchildren down there - took the three of them to Chipmunks on the Sunday for a couple of hours so the parents got a break. We would like to apologise for the delay in getting some of the orders out to you all but we never realized how popular our new jackets and the merino hoodies awould be. Fieldays are only a week away now and we are going flat stick to get everything done plus keep up with all our orders. The ladies are sewing long hours to get there, so they are really appreciated at the moment, as the pressure is on them to turn the work around in only a few days so I can get your orders to you in the quickest possible time. Well to let you into a little of what we will have on our stand at the Fieldays this year, there is going to be a range of adult merino clothing under the label name is LoLLA-Jane and it is all NZ made, Tamara is the designer and she will be available to answer any questions on the range for you. We are also having a selection of NZ Photos by BDPhotography there as well, so this year there will be something for everyone. Tamahere Market on Saturday 18th June 2011. Our site no is 54 (on the roadway). A great place to get top quality products and yummy food. At this stage we are not sure if we will be there as this will depend on our stock situation. Bring in your copy of this newsletter and we will give you 10% discount on your purchase. This will also apply to any orders you may place also. Our new stlyle of lined and unlined jackets with the full zip are very popular so we are looking for feedback on them please or maybe a photo or two. The lined ones are also very popular with the contrast lining. If we are are able to, we put in a contrast zip as well, but some colours we are not able to do so. 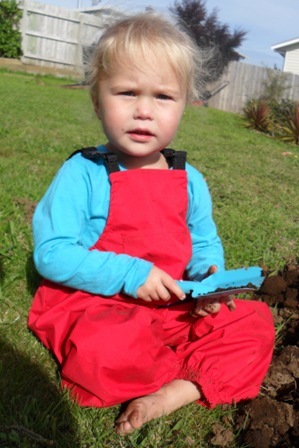 The contrast lining in the lined overalls is also gettng very popular, especially with the girls, as they can have their pink lining, as there is no fully waterproof pink available yet. At long last our order of gum boots are on their way so will be on the website at the weekend plus will do the same special of them on the site as at the Fieldays for a couple of weeks.